It is important to know which genetic and environmental factors regulate production of red pigments, or anthocyanins, in the skin of full red and blush cultivars of European pear. Insufficient red colour can reduce consumer appeal and profitability of production. In apple the process of red colour development is relatively well understood but for pears, much less is known. Development of red colour due to anthocyanin accumulation during fruit ripening is controlled by complex interactions between genetic and environmental factors. Light, temperature, carbohydrates, water stress and hormones all play a role but anthocyanin synthesis depends primarily on light. Biosynthesis of anthocyanins in plant tissues either requires or is enhanced by solar radiation (i.e. sunlight) with intensity and wavelength key elements. In general, higher solar radiation tends to increase flavonoid content in most fruit types. It appears that shorter wavelengths, in the range of blue and ultraviolet (UV), show the most prominent effects in accumulation of anthocyanins. However, specific information on responses to different light wavelengths is still scarce. In most fruit types such as apples, maximum colour is attained in ripe fruit. However, Steyn et al. (2005) found that the skin of some red and blushed pear cultivars displays an unusual anthocyanin accumulation pattern which involves attainment of maximum anthocyanin concentrations about midway between anthesis and harvest, with a slow decrease in synthesis and colour thereafter. With this pattern, highest anthocyanin content generally occurs in immature pears a month or more before harvest and colour tends to fade towards harvest. This accumulation pattern is reported for full red cultivars ‘Red d’Anjou’ and ‘Bon Rouge’ and for blush cultivars ‘Flamingo’, ‘Forelle’ and ‘Rosemarie’. 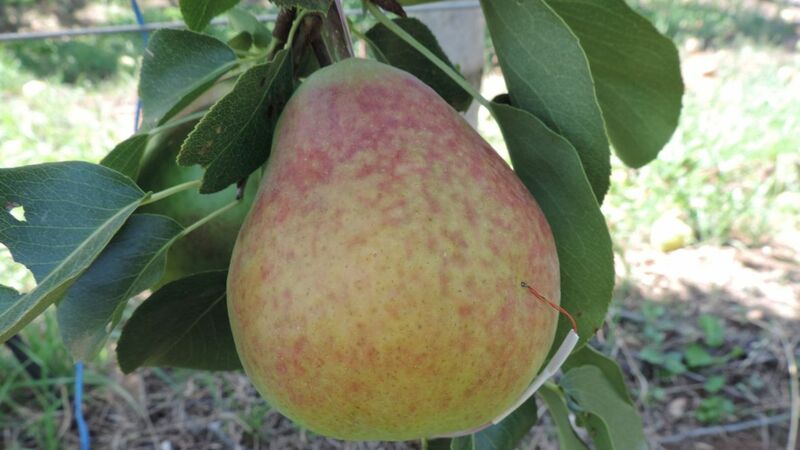 A lack of research on pears in recent years means that it is unclear whether the pattern is typical for the majority of coloured pears, many of which have been recently developed and released. Regardless of whether this pattern of red colour development is typical, the amount of blush on fruit at harvest is highly influenced by the maximum anthocyanin concentration that can be reached and the extent of subsequent colour fading (Steyn et al. 2004b). This means that despite reductions in anthocyanin concentration attributable to fading, fruit containing a high anthocyanin concentration change little in appearance before harvest. In contrast, fruit with little red colour development rapidly lose redness and become yellow/green under conditions favouring anthocyanin degradation, particularly when exposed to high temperatures. Van den Ende (2011) notes that under Australian growing conditions, redder ‘Forelle’ fruitlets with high concentrations of pigment, change colour more slowly during hot weather than do fruitlets with less red pigment. Typically low temperatures induce red development in many fruit types while high temperatures are generally associated with poor red colour development. For apples, red colour development in all cultivars seems to require or benefit from low temperatures but not all red and blush pear cultivars respond to low temperatures. Blush cultivar ‘Rosemarie’ grown in South Africa, required low temperatures for anthocyanin synthesis but the effect of cold temperature was much greater during early fruit development than in the week before harvest (Steyn et al. 2004a, Steyn et al. 2004b). Furthermore, ‘Rosemarieʼ pears lost red colour rapidly during intermittent hotter periods due to reduced anthocyanin synthesis and increased anthocyanin degradation, resulting in a net degradation of colour during pre-harvest growth and development. Compared to ‘Rosemarieʼ, colour development of ‘Bon Rouge’, ‘Flamingo’ and ‘Forelle’ is more stable and less responsive to temperature (Steyn et al. 2004b).It is not clear whether this red colour stability is caused by less degradation or as is suggested by Steyn et al. (2004b), a continuation of anthocyanin synthesis regardless of high temperature. Little is known about the behaviour of colour development in the red and blush pear cultivars grown in Australia. While light is critical for promoting red colour development, the high levels of solar radiation that can be experienced in Australian orchards over summer can increase skin temperature to the point where anthocyanin synthesis may be inhibited and active degradation or fading of existing colour begins (see Figure 1). Research in South Africa shows that before harvest, the contribution of radiation induced anthocyanin degradation to skin colour increases as the ability of pear fruit to accumulate anthocyanin decreases and this varies with different pear cultivars (Steyn et al. 2005). In conclusion, high levels of solar radiation stimulate anthocyanin synthesis in cool conditions but anthocyanin degradation may occur simultaneously when skin temperature increases, as may happen under Australian conditions. Whether the result is a colour gain or colour loss depends on many factors which are not well understood in Australia. They include cultivar, level of temperature and exposure time. 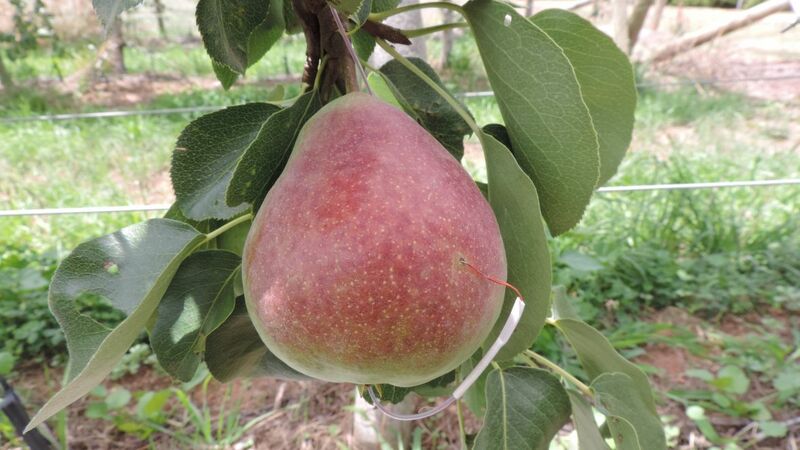 All these factors require further investigation under Australian conditions to more fully determine the dynamics of colour development in red and blush pear cultivars. A red blushed pear selection (ANP-0131) from the Australian National Pear Breeding Program (Tatura) that was photographed on 19 January (figure 1) and 23 February (figure 2). Fruit surface temperature was measured using a fine wire thermocouple inserted just below the skin. Note that blush has substantially faded most likely due to high fruit surface temperature from direct exposure to solar radiation (sunlight). 1AgriBio Centre, 5 Ring Road, La Trobe University Campus - Bundoora, Victoria 3083, Australia. Steyn WJ, Holcroft DM, Wand JE, Jacobs G (2004a) Regulation of pear color development in relation to activity of flavonoid enzymes. J Amer Soc Hort Sci. 129(1): 6-12. Steyn WJ, Holcroft DM, Wand JE, Jacobs G (2004b) Anthocyanin degradation in detached pome fruit with reference to preharvest red color loss and pigmentation patterns of blushed and fully red pears. J Amer Soc Hort Sci. 129(1):13-19.